Even if you don't do a lot of cooking, the kitchen is the biggest cleaning challenge in your Springs Apartments home. In addition to everyday dust and grime, you're dealing with food spills, stains and odors. 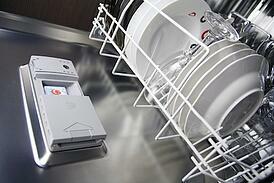 We've assembled a list of expert tips to keep your major appliances sparkling clean without investing a lot of time. Cut down on splatters by covering food with plastic wrap or a paper towel before heating. Steam heat makes quick work of caked-on debris. Place two cups of water in a glass bowl and heat for five minutes. Allow it to sit for a few moments before carefully removing the bowl and using a damp sponge or paper towel to wipe down the surface. Add a tablespoon of white vinegar or lemon juice to the water first to deodorize any lingering smells. Clean stains inside the oven with a paste of baking soda and warm water. Let it sit for five to 10 minutes before wiping away. Leave it on overnight for more stubborn stains. After running a dishwasher cycle, remove the racks and basket. Use a toothpick to clear the water holes on the spinning arm. Apply baking soda paste to a toothbrush and use it to clean the drain and the area around it, paying particular attention to larger pieces of debris. Dilute a mix of white vinegar and lemon juice with water and put in a spray bottle. Use it to clean the seal, the bottom of the door at the hinge, and the front of the machine. Wipe down the basket and racks before replacing. If the dishwasher has hard water stains, add two cups of white vinegar to the bottom and run the empty machine on the low cycle. Stop the machine mid-cycle and allow the vinegar to sit for about 20 minutes before resuming. Pull out all the contents, sorting them into items to keep and items to toss. Use a damp rag to wipe the bottoms and sides of containers before replacing them. Remove shelves and drawers and spray the interior with a vinegar and water mix. While the solution goes to work, wash the shelves and drawers in warm soapy water and set out to dry. By then, the interior will be ready to be wiped down with a clean towel. Make sure shelves and drawers are completely dry before replacing. Pour a half-cup of baking soda down the drain, followed by one cup of white vinegar. Let the mixture sit for a few minutes while you boil some water to rinse it out. Fill the drain with ice cubes and top it off with a cup of the coarsest salt you have. Turn the cold water on and run the disposal until the cubes have been completely chopped up. Have you run into a kitchen problem that's just too much to handle? Contact our friendly Springs Maintenance team for prompt and effective assistance.